The month of Ramzan, which is the Islamic month when the Quran was revealed, is marked by fasting between sunrise and sunset, prayers and charity and ends with the festival of Id-ul-Fitr. But Ramzan also spawns a temporary economy of charity, because wealthy Muslims are supposed to give away 2.5% of their valuation, called zakaat, during Ramzan, when any good deed is said to multiply. While it is hard to get a sense of how much money is given away, some estimates suggest that 75% of funding for madrasas (Islamic educational institutions) and orphanages comes during Ramzan. Also, 65-70% of such funds, nationally, are said to come from Mumbai. Salim Rajani, a plastic and stock trader from the Dongri area, says he will be giving away Rs1-1.5 lakh this Ramzan to madrasas and orphanages, about 30% more than last year, as the booming stock market has multiplied his investments. In fact, Muslim stock brokers send out valuations of their clients’ investments on the first day of Ramzan to help them calculate how much needs to be given away during the month. 1. People offering ‘namaz’ outside Mumbai’s busy Bandra station. 2-4. 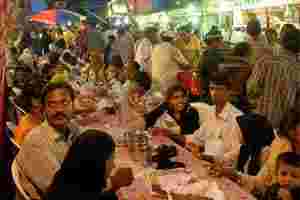 Hundreds of pavement stalls selling food, dry fruit, tradiotional perfumes (‘ittar’), shoes (‘mojdis’), clothes and other goods are set up during Ramzan around Jama Masjid. 5. Mumbai’s 80-year-old Suleman Mithaiwala sweet shop introduces a new sweet almost daily during the later days of the month. 6. Shopping for saris in the Madina area, near Hyderabad’s Charminar. 7. The area around Charminar wears a festive look during Ramzan. 8. A vendor selling ‘sewaiyan’ or vermicelli near Jama Masjid, Delhi. The vermicelli is added to milk to make a sweet dish. 9. Shopkeepers doing brisk business outside Bandra station, Mumbai. Kohl being applied just before namaz. 10. Top view of Mandvi area near Mohammed Ali Road, Mumbai. 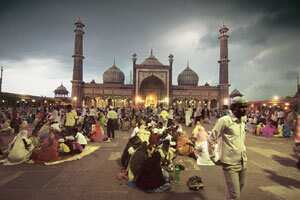 The Minara Masjid is also seen in the picture. 11. Shops open till late night at Pydhonie, Mumbai. 12. Haleem being sold at Pista House purcha in the old city of Hyderabad.